Chapman University Fowler School of Law's Practice-Ready Program is designed to add a critical skills component to existing bar tested and other doctrinal courses to help bridge the gap between law school and practice. Under the program, selected faculty members partner with accomplished and highly respected practicing attorneys and jurists to provide skills components to augment our rigorous traditional courses. The Practice-Ready Endowment—made possible through the generous support of the Fletcher Jones Foundation, the Dean's Board of Advisors, leading law firms and individual lawyers—allows the law school to bring these highly respected practitioners into the classrooms, practice labs and mock courtrooms. Our full-time clinical faculty members provide additional instruction in ten separate clinical courses each semester, supporting our six pro bono clinics. 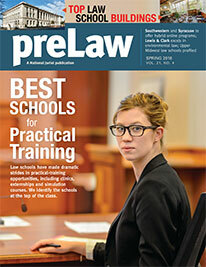 Fowler School of Law was named one of the Top 25 “Best Law Schools for Practical Training” by preLaw Magazine in 2018.